to support different OLTP modes. Most interesting: all scripts support --oltp-tables-count=N ( default 1), in this case N sbtest tables will be used. Good news for all Percona Software users out there. There are more ways how you can get access to Percona Software. If you’re using Scalr (See also Scalr Project on Google Code) you might be interested in Percona Server roles support Scalr team has announced recently. If you’re Mac user and looking for complete development environment for PHP and MySQL you can check out MNPP which also includes lightweight Ngnix web server instead of Apache. Now about any Open Source projects including or based on Percona Server or Xtrabackup ? Let us know ! There are many ways to slice and aggregate metrics of activity on a system such as MySQL. In the best case, we want to know everything about the system’s activity: we want to know how many things happened, how big they were, and how long they took. We want to know precisely when they happened. We want to know resource consumption, instantaneous status snapshots, and wait analysis and graphs. These things can be expensive to measure, and even more importantly, they can require a lot of work to analyze. And sometimes the analysis is only valid when very stringent conditions are satisfied. What metrics can we gather that provide the most value for the effort? There’s a relationship known as Little’s Law (sometimes erroneously referred to as the fundamentals of queueing theory), that lays out some simple properties between various metrics. One of the properties of Little’s Law is that it holds regardless of inter-arrival-time distributions and other complex things. And you can build upon it to create surprisingly powerful models of the system. Let’s begin with a query. It arrives, executes for a bit, and then completes. Then some time elapses, and another query arrives, executes, and completes. To add the minimal amount of extra complexity, let’s say that another query arrived while query 2 was executing, and completed after query 2 completed. Now we have the following picture, fully annotated. The arrivals and completions are denoted by “a” and “c”. If we start at the left end of the Time arrow, and call it the beginning of the observation period, and observe the system until the right end of the arrow, we have our observation interval. If we travel from left to right along the arrow, we can count the “residence time” as the time during which at least one query is running. This is the period from 1a to 1c, plus the period from 2a to 3c. I am in the habit of calling this the “busy time” for historical reasons, too. It’s easy to compute this by just creating a counter, a running total duration, and a last-event timestamp. Every time there is an arrival or completion, look at the counter of currently executing queries. If it is greater than 0, increment the duration by the time elapsed since the last arrival or completion. Then increment the counter of currently executing queries if the current event is an arrival, and decrement it if it’s a completion. Finally, set the last-event timestamp to the current time. Finally, we can simply count the number of arrivals or completions. It doesn’t matter which; Little’s Law is based on a long-term average, where the two are equal. The number of queries in the interval. The total time during which queries resided in the system — the residence time. We can maintain these variables in the system, and sample them at will by simply looking at the clock and writing down the three variables at the start and end of whatever observation period we choose. Throughput: divide the number of queries in the observation interval by the length of the interval. Execution time: divide the weighted time by the number of queries in the interval. Concurrency: divide the weighted time by the length of the interval. Utilization: divide the residence time by the length of the interval. This is extremely powerful. These are the key metrics we need to model scalability with the Universal Scalability Law, perform queueing analysis, and do capacity planning. And we obtained all of this without needing to analyze anything complicated at all. This is just addition, subtraction, multiplication, and division of some constantly increasing counters and durations! There’s more. We derived our four long-term average metrics from the four fundamental metrics, and we derived those in turn from the arrivals and completions. In a future article, I’ll show you what else we can learn by observing arrivals and completions. And I’ll present on this at Percona Live, where I’ll show you how to tie it all together quickly to answer real-world questions about practically any system, whether it’s instrumented with the variables I mentioned or not, with shockingly little effort. PS: I’ve edited to reflect Dr. Gunther’s comments, which I solicited. Also, readers should know that these are the four metrics that I think of as fundamental — I’m not referring to any established standard. PPS: updated to clarify “counter” versus “duration” as per Mr. Wilson’s comments. I have just finalized the tour schedule for my “SQL Performance Basics Workshop for Developers“. The most important tips and tricks every developer must know—in just 3 hours. It takes place in your office because every developer—the entire team—should take part. The tour covers Austria, Germany and Switzerland. Just let me know if there isn’t a scheduled date for your area. I’m sure we can arrange something. Small teams can also take the virtual workshop. As continuation of my CPU benchmarks it is interesting to see what is scalability limitation in MySQL 5.6.2, and I am going to check that using PERFORMANCE SCHEMA, but before that let’s estimate what is potential overhead of using PERFORMANCE SCHEMA. 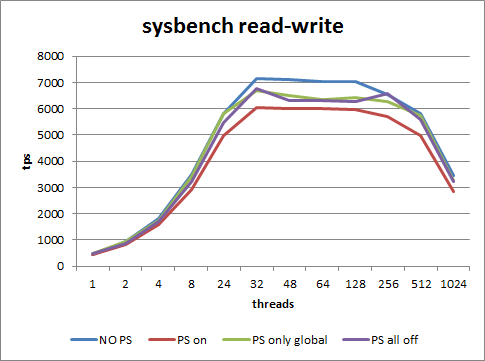 So I am going to run the same benchmarks (sysbench read-only and read-write) as in previous post with different performance schema options and compare results. with “global instrumentation” only –10%, and with all disabled consumers – about 8%. with “global instrumentation” only –11%, and it is about the same with all disabled consumers. Is that big or small ? I leave it for you to decide, I think it may be acceptable in some cases and not in some others. I wish only that Performance Schema with all disabled consumers gives less overhead, 8-11% seems significant. If nothing helps I would like to be able to fully disable / enable performance schema in run-time, not at start-time. 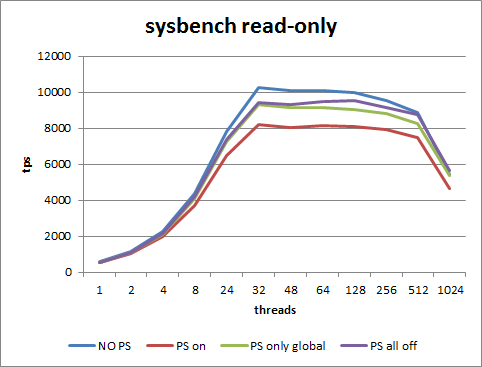 As I understand dtrace / systemtap probes can be disabled / enabled at run-time, and when they disabled – it is almost 0% overhead, why Performance Schema can’t do the same ? Harrison Fisk, from the Facebook database team, will be in New York City delivering the closing keynote at Percona Live next month. He’ll be talking about the present status and future plans for MySQL inside Facebook’s environment. As you probably know, Facebook is one of the largest users of MySQL, with their own set of patches, and the Facebook team is very open about how they use MySQL and what their challenges are. This is a great chance to hear from Harrison in person and ask questions — and we have a great lineup of other speakers, too. Check out the list of sessions for more information. One quick note, sort of a “to whom it may concern,” is that the proper trademarked names of our products include “Percona Server”, “Percona XtraDB”, and “Percona XtraBackup”. “XtraDB” and “XtraBackup” are also Percona trademarks, but the proper names of the products include “Percona” at the beginning. The word “xtrabackup” alone and lowercased is only proper when referring to the xtrabackup compiled C binary, e.g. in how-to documentation in a context that includes the whole product name. We are happy to grant written permission for appropriate use of the trademarks. We’re working on publishing an official trademark policy on our website. We continue progress towards our Percona Server 5.5 release. Percona XtraBackup is ready to try on Windows. We’re working on porting the Percona XtraBackup test suite to Windows. Our Debian packages now link against readline, not editline. We did a lot of work on testing, merging forward to new versions, and bug fixing last week. It is hard to make apples to apples comparison, but I think it is still interesting. Cisco UCS C250 has total 12 cores / 24 threads of Intel Nehalem X5670, and Dell PowerEdge R815 has 48 cores of AMD Opteron 6168. One of biggest difference is that Cisco is running CentOS 5.5 and Dell R815 is based on RedHat EL 6. I will probably will need to rerun benchmark after upgrade Cisco to CentOS 6 ( will be it even released or it is dead ? ).